W. Ben Hunt's classic has earned a reputation as the" authentic handbook since it was first published in 1939. 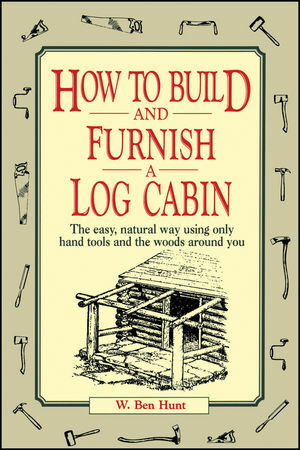 Updated in 1974, it remains the only step-by-step guide to building log cabins and log furniture -- pioneer style." W. BEN HUNT, a self-taught expert on the crafts of the Plains and Woodland Indians, was born in Wisconsin in 1888. Most of his life was spent teaching, creating artwork, building cabins and furniture, and lecturing about the out-of-doors. He is the author of many books, including Macmillan's The Complete How-to Book of Indiancraft. Introduction to Log Cabin Construction. 1. The Cabin and the Site. 2. Logs and Other Materials. 7. Windows, Doors, and Shutters. 8. Floors, Stairs, and Ceilings. 9. Partitions, Additions, and Porches. 10. Fixtures and Fireplace Equipment. 12. Reconditioning Old Log Cabins. 16. Interior Fixtures and Equipment.